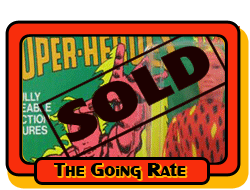 You are bidding on a mint-on-card, type 2 AMAZING SPIDER-MAN figure from Mego's World's Greatest Super-Heroes line of toys. this package is the "1978" 2nd Issue/2nd Version ©1978 (Marvel) Card (c2-MV-78), first released in the fall of 1978. This mint figure comes factory-sealed on its original Mego cardback. The bubble has one dent in the upper-left-hand corner, but, otherwise, does not appear to have any conspicuous dents, dings, or crushing, and is completely sealed all the way around, including between the feet. The card itself lies fairly flat and has only one corner--the bottom-right-hand--that has any notable wear. The residue from a previous price sticker appears on the upper-right-hand corner of the card, but does not unduly detract from the overall appearance of the piece. There is no reserve, and I am starting the bidding at only $9.99. This item will sell, and I trust the market to dictate the true value of this beauty. Please look at the provided pictures, as they constitute part of this item's description. SELLING POLICIES: In general, I do NOT accept returns. However, I do absolutely guarantee that A) what you see is what you get (that you will receive the EXACT item pictured, in the EXACT condition pictured, and that I will happily provide any additional pictures upon request), and B) I will NEVER sell a Mego figure with a reproduction part--never. I will only accept a return if I have unwittingly violated one of those guarantees. Another crow_t._robot auction result. Sewn on sleeve style sold for $28.50. That is super low! Rare MEGO Secret Identity Peter Parker Alter ego. I got these from the original owner. They had been in storage for decades. I'm no expert on these, but head paint looks great. Pants and Sweater are nice and clean and have bright colors. Unfortunately the elastic waistband is almost completely out of the pants (I assume it could be repaired?) The shoes are a really thin plastic and do have some small tears near the laces(they might of all came like this). Please ask any questions you might have about these or let me know if you want more pics of them. Thanks.